Hey pals. Just thought of another topic for discussion on the subject of coffee. 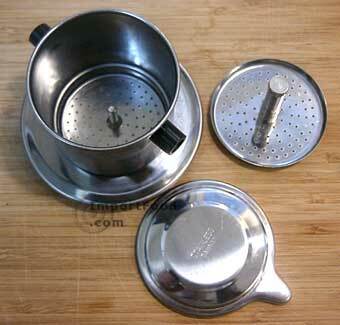 I am trying to perfect the stove top /moka coffee at home and it is bugging me because I can’t get a consistent taste. I just tried something just then which sort of made it a smoother taste. I boiled the water in the base and when it was boiling I chucked the coffee in the basket then screwed on the top. It’s not too bad. The thing I am finding difficult though is getting a nice crema. Aeropress. No more, no less. Anyone care to share their methods? Vietnamese press. Is better, i guess. I’ve never tried the aeropress - what’s its deal? Using hot water will definitely give you a better brew. I usually boil the kettle and then use that. Is your machine new? Sometimes they take a little while to ‘season’ I’ve found. One trick I picked up off my dad is making a crema with sugar and the first bit of coffee that comes out. A bit hard to explain in words but this guy has the technique down pretty good. I have never heard of Aero or Vietnamese press… do share. My moka is new since march and gets used every Saturday and Sunday. I have never washed it in soapy water. So as for ‘seasoning’ she is good to go. I have been trying different beans though from a local roaster. I have a Bavarian Vanilla grind going at the moment. Makes the house smell good. I’m going to have to try that sugar crema, I only have half so will see if it works. I was always under the impression that you couldn’t get a real crema with a stove top. Something to do with the low pressure that a stove top makes coffee compared to an espresso machine that forces the water through resulting in the creama. Bialetti make a stoke top (Brikka) with a valve on it that holds the water back until a certain pressure is reached then the water is forced through the coffee and you get a crema. I have never tried one - I just have a normal stove top. Boiling the water before hand is the best way to get a consistently good coffee. After that it all comes down to how well you pack the basket. I use a bialetti aluminium stove top. no crema but nice thick, dark coffee. i haven’t tried boiling the water first though. I alway thought it was better to use cold water because the aluminium heats it really quickly anyway. Get your self an Atomic! I will up load a pic of the Atomic and Find out he mob that do reproductions. I’ve got a Lelit Combi. Makes a nice brew. So Blakey, the Aeropress - $50 for a plastic cylinder/plunger thingy: it it worth it? I usually stir it up in a separate cup so i can add a little more sugar to make it easier to whisk. It’s not a real crema but gives you something to do while you wait for the rest of the coffee. quad shot, shitload of crema. real mans coffee. when i’m not at uni i work in an architect’s office. i don’t think i could handle the job except for the endless supply of good beans and a decent mini espresso machine. then again, without the machine, i don’t think i’d have a job, since i spend so much of my time making the coffees for clients etc. this little symbiotic relationship means i make a lot of cups per day, which in turn means i spend half my life on a buzzing high somewhere up near the ceiling. my housemate has a italian-style stovetop one, it’s ok, but my other housemate’s espresso machine leaves it for dead. it’s all about the high pressure and fairly quick run, not too much contact time between the hot water and the ground coffee. longer run = more bitter taste. def going to try the boiling water in the stovetop maker though, sounds good. cà phê sữa đá (vietnamese white iced coffee) is a cracker during summer. Our little $100 Sunbeam coffee machine works perfectly fine at work. I don’t know if it’s a 15bar or not, but I don’t understand people spending more than $2000 in a coffee mahcine. 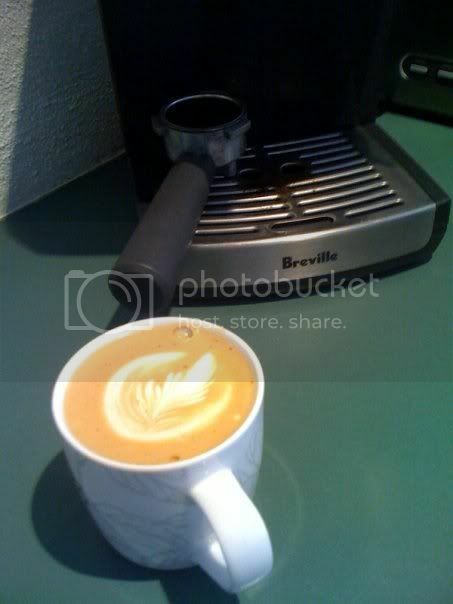 I have a breville home espresso machine that was given to me. As for the coffee, blagh. Way to watery. The steam wand is okay though, I can get a decent enough steamed milk for pretty patterns in the crema. it’s all about the high pressure and fairly quick run, not too much contact time between the hot water and the ground coffee. longer run = more bitter taste. Not exactly. Your grind and tamp should be such that your shot time is around 25 to 30 seconds. You are right that too long makes it bitter, but too quick gives a thin sour coffee. haha post of the day! Blakey probably won’t talk to you ever again you realize?